Government Model Higher Secondary School Nadavaramba (GMHSS Nadavaramb) located at Nadavarambu, a place just 3 km away from Irinjalakuda Town, Thrissur District, Kerala, India. Nadavaramba School was initiated as a Lower Secondary School - Anglo-Vernacular Lower Secondary School - in 1920 by an eminent personality Mr. C.S. Viswanatha Iyer who became the first Headmaster of the Nadavaramba School. In 1932, the Anglo-Vernacular Lower Secondary School was taken over by Department of Education due to age and physical weakness of Mr. CS Viswanatha Iyer. 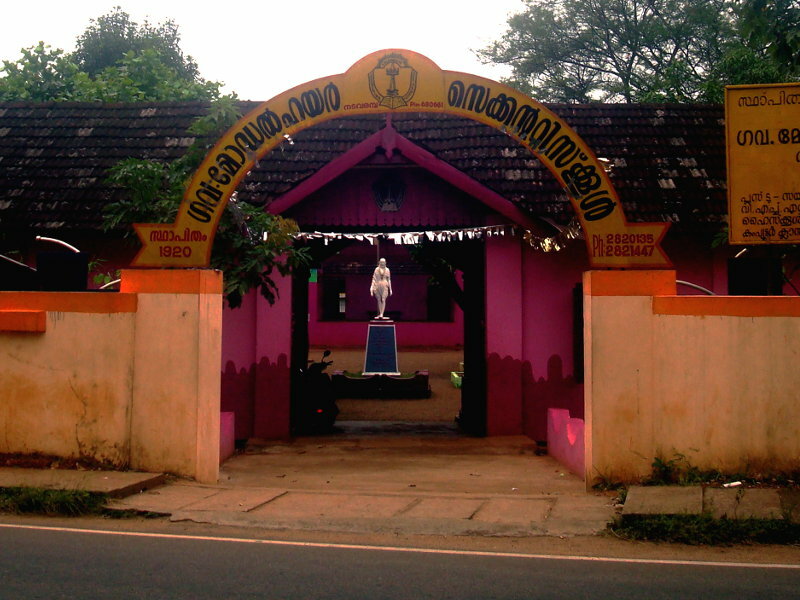 In 1974, the Department of Education has recognized the Nadavaramba School as a Model School. Providing good and modern facilities, the GMHS School Nadavaramba expects great achievements from their students that reflects in their final exams. Laboratories in GMHSS Nadavaramb: To provide the extensive knowledge to their students, GMHSS Nadavaramb has the laboratories of Physics, Chemistry, Botany, Zoology, Computer and geography. Projector Room in GMHSS Nadavaramb: A highly sophisticated projector room is at work with LCD Slide projector, Overhead projector and computer system to enable the students face various entrance examinations confidently. Physical Education in GMHSS Nadavaramb:As part of personality and achieve great heights in sports, special coaching is given for football. Their football team has won ‘Subrato Tournament 2007’. The training for various sports events are provided under the guidance of Ms. Kochurani M.K. Nadavaramba School has very active clubs like: Environmental club, Science club, Maths Club, Social Science Club, Tourism Club, Literary Club, National Service Scheme, Anti-Alcoholic Club, Career Guidance and Counseling Club, Entrepreneurial development Club. Cleanliness being the essential pre-requisite as far an educational institution is concerned, Nadavaramba School gives it a priority to maintain proper hygiene within the institutional surroundings. As part of the vigorous Waste Free Campaign by the District Panchayat, the Nadavaramb School observes one period in each week as ‘Dry Day’. An inevitable ingredient of the same is the comprehensive cleaning process in the entire school environs, in which the amazed waste is consequently segregated into organic and inorganic waste matter and those which could be burnt are set fire to. As part of the program dynamic activities are being conducted in the school by selecting two persons from each class as Zero Waste Managers and forming a school level Sanitation-Health Club including the members of the School Democratic Forum and entire Zero Waste Managers. The Nadavaramba School has produced innumerable celebrated personalities who are spread around the world and has become the goodwill ambassadors of the school. Many of them adorn prestigious places in various institutions. Mr. M.L Kuriappan Master, who won the State as well as National Award for Excellent Teacher, Mr. Balachandramenon, who retired as the Squadron Leader in the Indian Air force, Mr. P. Govindankutty Menon, who won the State award for best teacher, Ms.
Kavitha Balakrishnan, the famous painter, and many renowned sports persons like Mr. P.D Antony, Mr. M.S Raghunandanan, Mr. Justin Joseph etc. who performed exceedingly well in the National level. For any clarifications, suggestions and feedback please contact them with your valued input.